페니케, 포르투갈의 캐스트어웨이 42966/al | 호스텔월드에서 예약하세요. Welcome to Castaway Hostel, the new hostel in Peniche, Portugal. This new hostel is made for people who is eager to enjoy one of the most beautiful areas of Portugal. 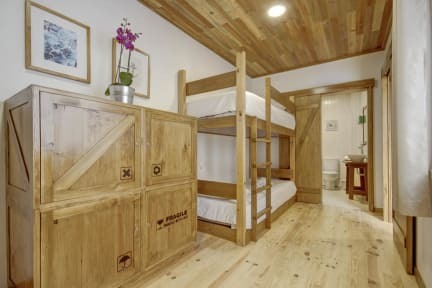 Composed of two dorms, all of them made of wood, this new hostel counts with handmade and hardwood furniture, ceilings and floors. In additions, the guests will have the opportunity of enjoying several common and social areas such as a kitchen, dining room, living room and several outdoor spaces where there are a BBQ facility plus tables , chairs and even a couch. Our location is magnificent. From our hostel, you will be able to reach the most important points of Peniche such as Baleal Beach, which is just two kilometers away or Restaurant Taberna do Ganhão, one of the best places to enjoy the Portuguese cuisine in the Peniche area. Furthermore, from our location you can reach Peniche in ten minutes by car or public transport, so it is pretty easy to go there an enjoy of the landmarks such as the Fortress or the Museu da Renda de Bilros de Peniche. We have two dorms, one mixed and the other one for girls. 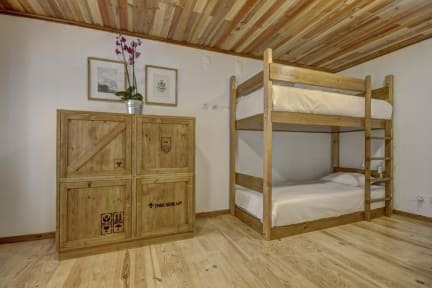 All of them are equipped with bunk beds and the beds are very spacious and comfortable. In addition, the shared bathrooms are next to the dorms and they are equipped with all the hygiene accessories that are need it.